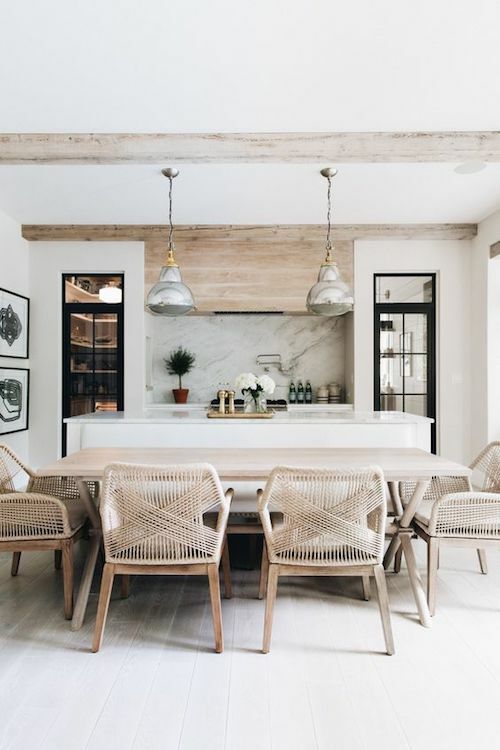 This Rushcutters Bay kitchen won many accolades in 2017 including the KBDI Kitchen Designer of the Year Award, and the NSW Large Kitchen Design Award. Here we revisit some of the striking details in this Sydney kitchen designed by Blue Tea designer Marianne that lead to it’s winning achievements. 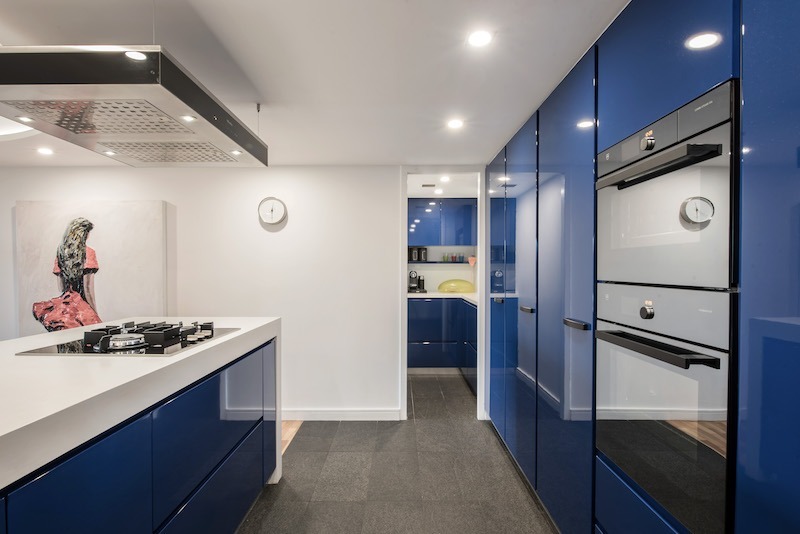 Blue cabinetry was a bold move away from the safe haven of neutral colours. Marianne aimed at capturing the clients’ love of the harbour by the bold use of blue. She experimented with many different blue samples, before settling on the winning blue shade. A brilliant and bright blue was agreed on. A high gloss, shimmery surface was selected, an interpretation of the light reflecting on the blue surrounding harbour of Rushcutters Bay. The clients were keen to select a Corian benchtop as they had previously owned and loved this benchtop material. The benefits of Corian are plentiful. It is a seamless material, once installed onsite there are no join lines. An acrylic base means that it is flexible and it is easy to create custom shapes and seamless designs.Being a softer material than stone, Corian will get light surface scratches with time. However, unlike stone, Corian is able to be buffed back into it’s original sparkly and pristine state. Marianne chose to use Venaro White Corian, a fresh white colour to keep the design light and bright. The colour choice also fits perfectly with the finished walls and ceiling colour, allowing the space to feel integrated and uncluttered. The island is adjustable and electronic.The benchtop height can be adjusted, allowing guests to centre around and use it as a table or a bar. A mirrored base gives the illusion that the thick, white benchtop is floating above the floor. The clients wanted the space to be multifunctional, and the design solution delivered just that. 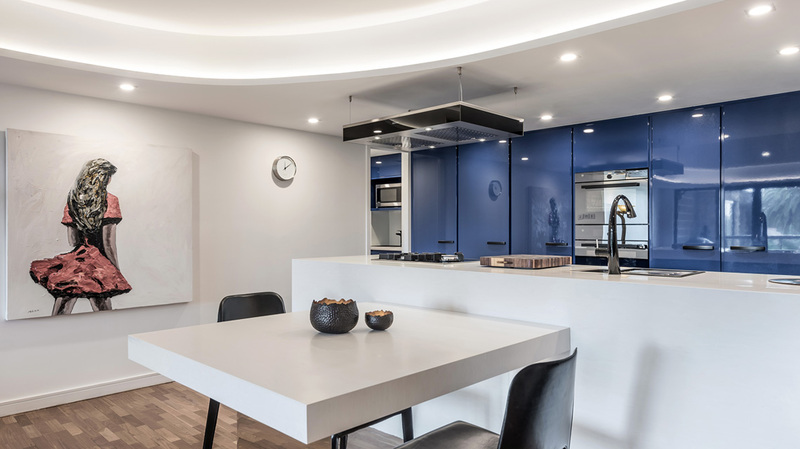 The showcase kitchen (with a hidden butlers pantry) can be kept uncluttered, and the adjustable benchtop allows the space to be transformed depending on the clients’ needs. 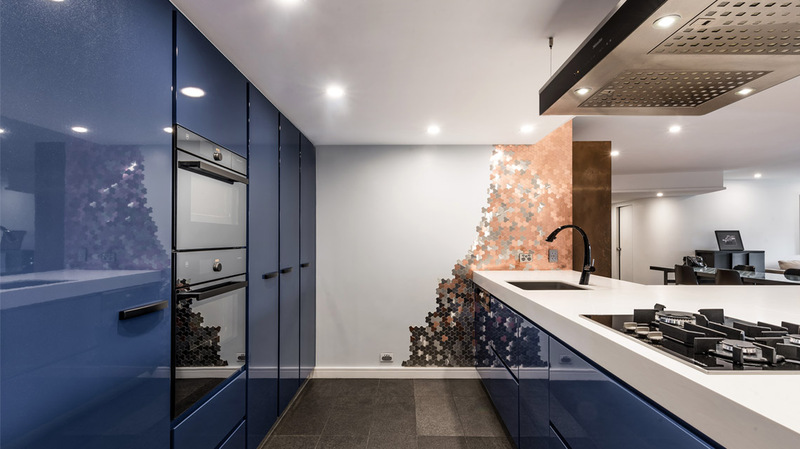 A copper mosaic wall draws your eyes into the kitchen space. A luxurious material, the copper mosaics are elegantly placed to offset the white walls and benchtop. It again pays reference to the sparkling sun shimmering on the surface of the water.The tiling is detailed to include silver mosaics as it progresses down towards the floor. It is as though it shows the passing of time and the setting of the sun. A design feature, the mosaics are allowed to cascade down the wall. It is a striking material, meaning too much of it would have been overpowering in a space that is already rich in brave choices. When it comes to incorporating a pantry into your new kitchen, a butler’s pantry is the grandest of all pantry layouts. The clients wanted to have a showstopping design that was clutter free. Hence, the butler’s pantry was the perfect fit for them. Hidden out of sight, a butlers pantry can be used to house bulky appliances, store goods, and a secondary place to prepare food and hide clutter.Much of the workings in this kitchen happen here. Housed in their butler’s pantry are an extra sink, dishwasher, microwave, storage and bench space. This ensures the front can be kept neat and tidy; effortlessly. The working engine of the kitchen is tucked away neatly out of sight. To conclude, this kitchen was a brave move away from neutral tones. Instead, the client was looking to make some bold but practical design statements. 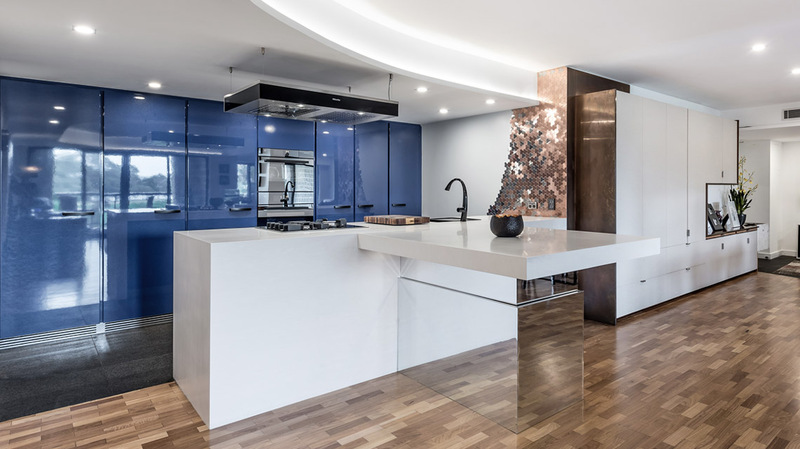 A showpiece kitchen that provides flexible spaces ensured the winning accolades this kitchen achieved.Find out why we are award winning kitchen designers in Sydney by clicking here. Rushcutters Bay is an eastern suburb of Sydney, NSW and is around 3 km from the Sydney CBD. Surrounding Rushcutters Bay are the suburbs of Paddington, Darling Point, Darlinghurst and Elizabeth Bay. The area received its name from the first settlers because of it was covered in rushes which were used to thatch their houses. Its original name was Rush Cutting Bay. The area is quite popular for young professionals because of its proximity to the Central Business Disctrict and the wide range of available housing which ranges from flats and apartments to top of the range luxury pads. It's also a great area for couples with kids and those raising a family because of its low crime rate, great public transport and of course Rushcutters Bay Park which has a playground for the kids. If you're into your sailing, head down to the prestigious Cruising Yacht Club. Anne Janey on www.homely.com.au gives it a star rating of 4 out of 5. You can read her review here. The small harbour side suburb of Rushcutters Bay is located 3 kilometres east of the Sydney CBD in the local government area of the City of Sydney. It has a population of about 2,200, 5% of whom are under 18 and 20% of whom are over 60. The main age group of the suburb is between 25 and 50. It is a suburb of high and medium density housing offering a wide range of prices for apartments. There are small one bedroom flats, right up to luxurious penthouses. There are also a lot of rental properties – a favourite place for the young to rent because of its proximity to the city.